There are 42 Assisted Living Facilities in the Burlington area, with 4 in Burlington and 38 nearby. The average cost of assisted living in Burlington is $4,300 per month. This is higher than the national median of $3,346. Cheaper nearby regions include Bensalem with an average starting cost of $3,250. To help you with your search, browse the 216 reviews below for assisted living facilities in Burlington. On average, consumers rate assisted living in Burlington 4.6 out of 5 stars. Better rated regions include Ambler with an average rating of 4.7 out of 5 stars. Located in Burlington County, New Jersey, the city of Burlington played host to the first European settlers in the state and boasts more than 45 sites that mark the origins of significant historical events and places. For seniors seeking to establish residency in this historic neighborhood and who need help with daily living, there are four assisted living facilities within the city and 38 others in adjacent neighborhoods. 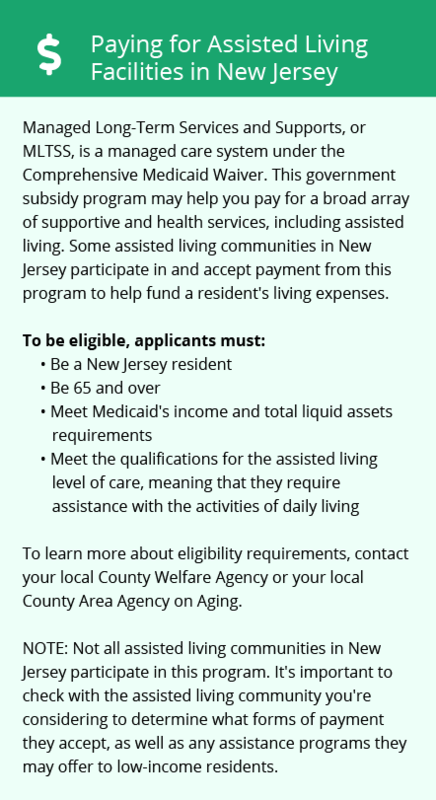 These communities, known in New Jersey as Assisted Living Residences, are licensed by the state's Department of Health. Burlington has an array of community resources for seniors, including the Senior Recreation Program, managed by the city's Recreation Division under the Department of Public Affairs. Seniors pay a minimal lifetime membership fee to gain access to free activities held twice a week at the Keegan Center. New Jersey does not deduct income taxes from Social Security benefits, which may give Burlington seniors a reasonable amount of savings. The state also implements lower income tax rates for low to moderate retirement and pension earning. The Burlington area is home to world-class medical facilities, including the Cooper University Health Care and the Burlington City Health Center, in the event of medical emergencies or illness. The streets of Burlington are lined with historical structures that provide a glimpse of the city’s cultural heritage. The city government offers guided walking tours along these scenic places and gives discounts to groups and seniors. Burlington seniors can take advantage of around 207 sunny days a year for leisurely walks around the city’s main attractions. The comfort index is listed at 47 out of 100, slightly lower than the national average of 54. Summer months may be slightly humid, with the average high temperature of 87 degrees a little above the comfort index of 70 to 80 degrees. Although the city’s overall cost of living index of 101 is almost even with the national average of 100, this is far below the state’s overall cost of living of 133, making Burlington one of the more affordable locations within New Jersey. Assisted Living costs in Burlington start around $4,300 per month on average, while the nationwide average cost of assisted living is $4,000 per month, according to the latest figures from Genworth’s Cost of Care Survey. 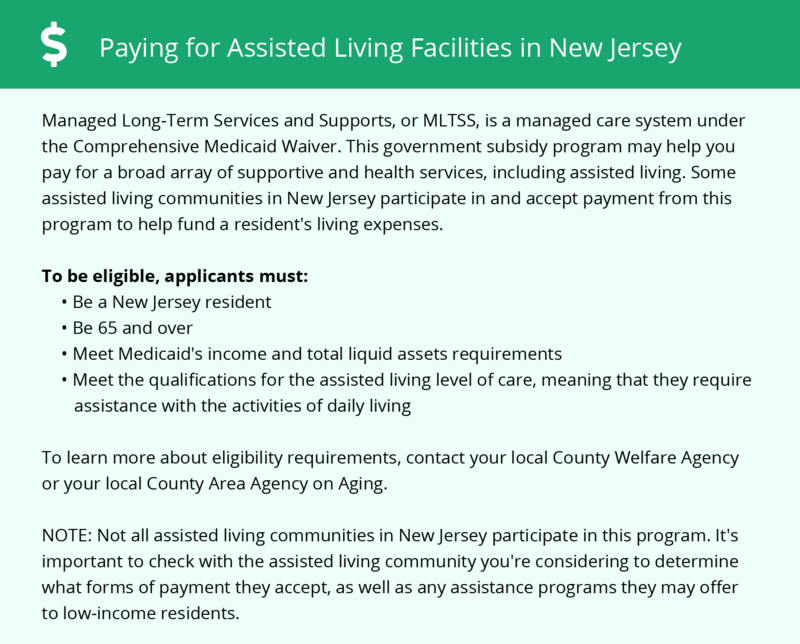 The New Jersey Department of Human Services, Division of Medical Assistance and Health Services administers the Medicaid Managed Long Term Services and Supports program under the Comprehensive Demonstration Waiver. Eligible Burlington seniors are entitled to services coordinated through FamilyCare managed care organizations. Assisted living, community residential services and nursing home care are covered by this program. To see a list of free assisted living resources in Burlington, please visit our Assisted Living in New Jersey page. Burlington-area assisted living communities must adhere to the comprehensive set of state laws and regulations that all assisted living communities in New Jersey are required to follow. Visit our Assisted Living in New Jersey page for more information about these laws.